Mozilla today officially launched Firefox 26 for Windows, Mac, Linux, and Android. Additions include Click to Play turned on by default for all Java plugins, more seamless updates on Windows, and a new Home design for Android. Firefox 26 has been released over on Firefox.com and all existing users should be able to upgrade to it automatically. As always, the Android version is trickling out slowly on Google Play. First and foremost, the Click to Play revamp was supposed to be for all versions of all plugins, except the latest release of Flash. Unfortunately, Mozilla has pushed back this change and decided to focus on just Java. In short, the feature means Firefox now only loads Java plugins when users click to interact with them. Previously, Firefox would automatically load Java whenever a site requested it, unless Mozilla had blocked it for security reasons (the company already blocks old versions of Java, Silverlight, and Flash). Now, when a site tries to use Java, the user can choose whether to enable the plugin on that site. Firefox will only load it when you take the action of clicking to make it play. Alternatively, you can also configure Click to Play so that it always runs plugins on a particular website. NEW: All Java plug-ins are defaulted to ‘click to play’. NEW: Password manager now supports script-generated password fields. NEW: Updates can now be performed by Windows users without write permissions to Firefox install directory (requires Mozilla Maintenance Service). NEW: Support for H.264 on Linux if the appropriate gstreamer plug-ins are installed. CHANGED: Support for MP3 decoding on Windows XP, completing MP3 support across Windows OS versions. CHANGED: CSP implementation now supports multiple policies, including the case of both an enforced and Report-Only policy, per the spec. DEVELOPER: Social API now supports Social Bookmarking for multiple providers through its SocialMarks functionality (see MDN docs). DEVELOPER: Math.ToFloat32 takes a JS value and converts it to a Float32, whenever possible. DEVELOPER: There is no longer a prompt when websites use appcache. DEVELOPER: Support for the CSS image orientation property. 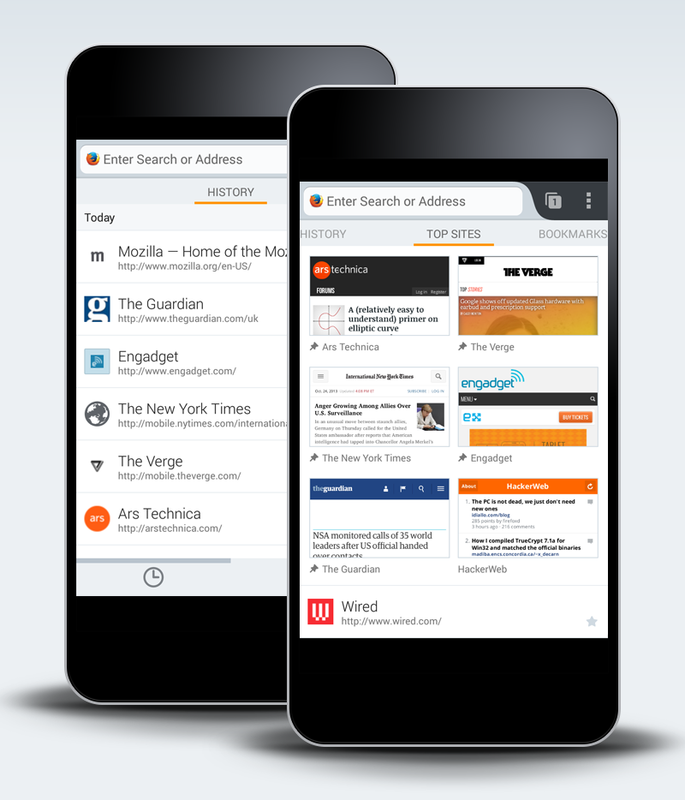 DEVELOPER: New App Manager allows you to deploy and debug HTML5 webapps on Firefox OS phones and the Firefox OS Simulator. DEVELOPER: IndexedDB can now be used as a “optimistic” storage area so it doesn’t require any prompts and data is stored in a pool with LRU eviction policy, in short temporary storage. FIXED: When displaying a standalone image, Firefox matches the EXIF orientation information contained within the JPEG image (298619). FIXED: Text Rendering Issues on Windows 7 with Platform Update KB2670838 (MSIE 10 Prerequisite) or on Windows 8.1 (812695). FIXED: Improved page load times due to no longer decoding images that aren’t visible (847223). FIXED: AudioToolbox MP3 backend for OSX (914479). If you’re a Web developer, you should probably also check out Firefox 26 for developers. The biggest change on Android is the redesigned startup screen, which appears when you launch Firefox for Android, open a new tab, or tap on the URL bar. The new page, called Home, gives users quick and easy access to their browsing data, including top sites, history, bookmarks, Reading List, and search. Home is displayed in a simple set of swipeable panels which provide a much more fluid way to browse the Web. It’s the first thing a user sees when starting a new browsing session, opening a new tab, or tapping on the URL bar. NEW: Updated about:home interface with Top Sites thumbnails, and ability to pin tabs to home page. CHANGED: Performance improvements on some Nvidia devices. FIXED: About:home is missing translations in some locales. Most affected are: ca, ga-IE, hu, ko, pt-BR, pt-PT, ro, and uk (933323). FIXED: In some cases, the clip set on the page doesn’t update when the addressbar hides (928977). FIXED: Invalid position:fixed rendering (923969). What’s not mentioned above is that Firefox for Android now supports smartphones and tablets that run Intel x86 processors. Some examples of these devices are: the Motorola RAZR i, ASUS Fonepad ME371, Acer Liquid C1, Lenovo K900 IdeaPHone, and the Samsung GALAXY Tab 3 (10.1). If you’re having difficulty keeping track of all these updates, don’t worry. Firefox 27 will be out in February.